Capacitors of values between 2.2pF and 470nF are not polarised so can be connected any way round. Disc ceramic capacitors are marked with a three digit code. The first two digits give the two digits of the value and the third digit tells you the number of 0s, the value is always in pF. Example 223 is 22000pF which is the same as 22nF. There is a capacitor code calculator to convert the codes for you. But be careful sometimes a 100pF capacitor is marked 101 and sometimes 100 so you may have to check it with a meter! 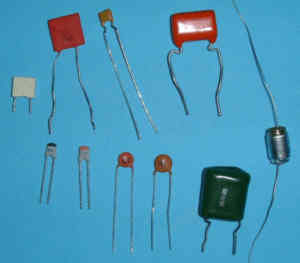 Some of the small ceramic capacitors are marked with the value in digits and letters p for pico or n for nano. The letter is in the place of the decimal point. Capacitors of 1mF and larger are all electrolytic. It is very important that you connect these the right way round otherwise they can explode! The negative end usually has - sign next to it or an arrow pointing to the - lead.